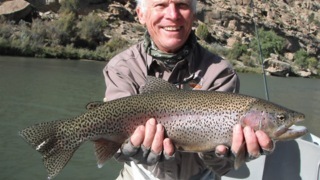 This was my first time fly fishing on the San Juan River. A friend, a seasoned veteran of the San Juan, said for my first trip we should get a guide and boat. Drift boat fishing was also another first for me. Fishing via drift boat, I would get a better feel for the whole river. The late September weather was great. We had a nice day and I was really happy with landing a couple rainbows that were 22" and 20". My friend also had nice day by landing some real nice browns. Altogether we caught several fish that day. The guide was really nice in that he had lots of patients with me. 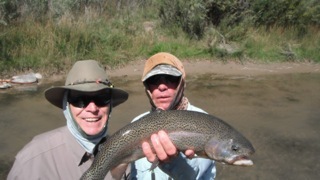 I really learned a lot on the trip, skills that will make me a better fly fisherman.